I've been hunting in the last two days! Armed with pens and watercolors, my mission was to find sketchers across the city and capture them in my sketchbook. They could be found everywhere, from Santa Catarina street to Ribeira, and from one day to the other their number had increased. I have the guess that tomorrow they will be even more, one single sketchbook not being enough to accomodate my trophys. My first two victims on Sunday were Volker and Martina from Germany, who were busy struggling with the granite intricacies of the Clérigos church front. 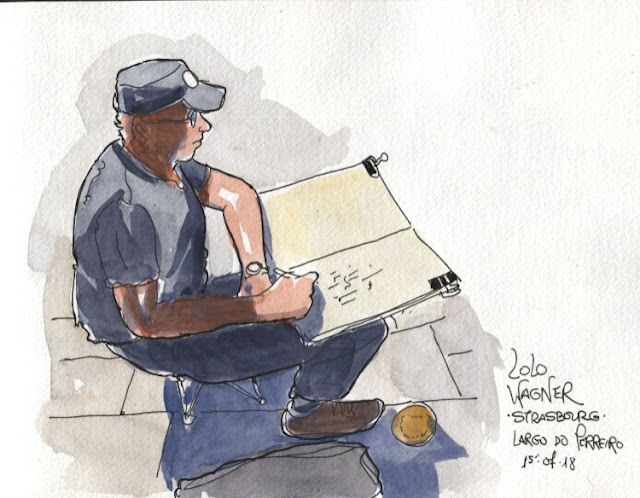 Being a fan of his work, I was happy to find a very concentrated Lolo Wagner, from Strasbourg, at terreiro square in Ribeira. 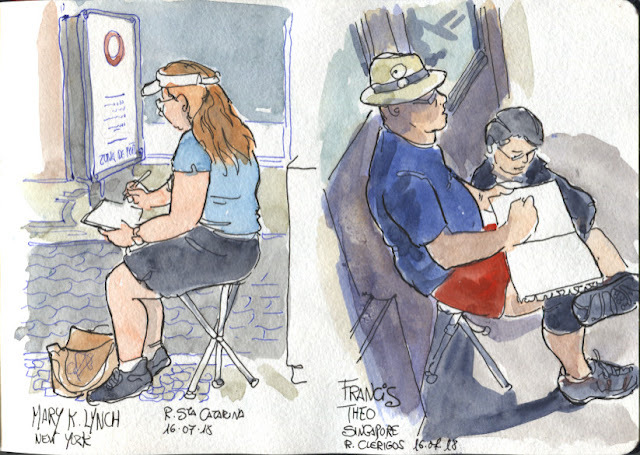 Up to the center at São Domingos square, just before Flores street, Susan Wilson and Marcia Pugsley from California, and Elizma Duvenage from South Africa were sketching while enjoying some tapas. We ended up having a nice chat and that was all for Sunday. 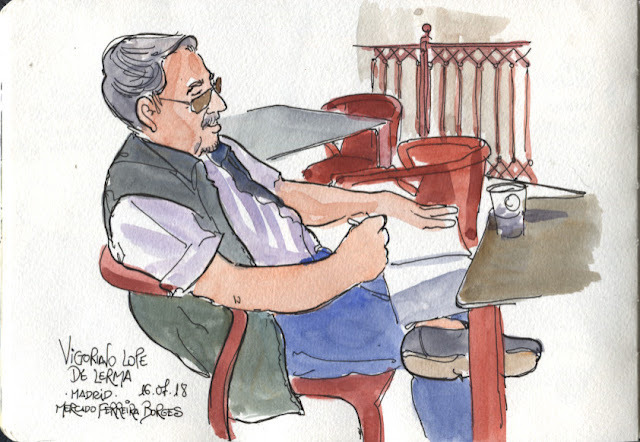 Early Monday morning in Santa Catarina street, just in front of Majestic Cafe, my first sketcher sighting was Mary K. Lynch from New York. 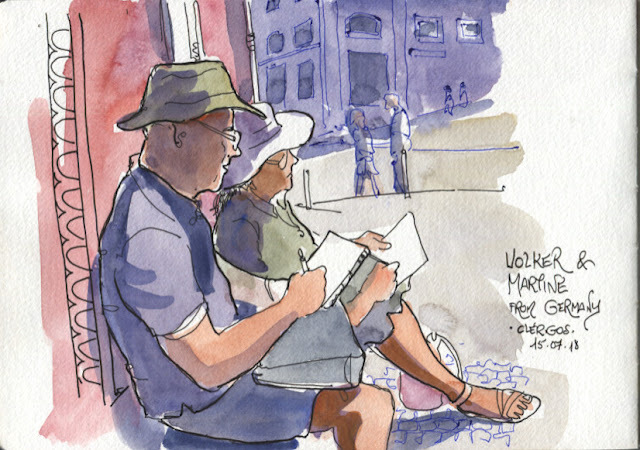 In Clérigos street, under a strong morning sunshine, Francis Theo from Singapore was sketching the nearby Lóios square in the company of his wife. The riverside is undoubtedly where you can find more sketchers. If you don't see them anywhere else, go down to the Douro and start counting. My first riverside victims were Gaby Krein and Malou Mathieu from Luxembourg, in the company of Tine Klein from Switzerland. 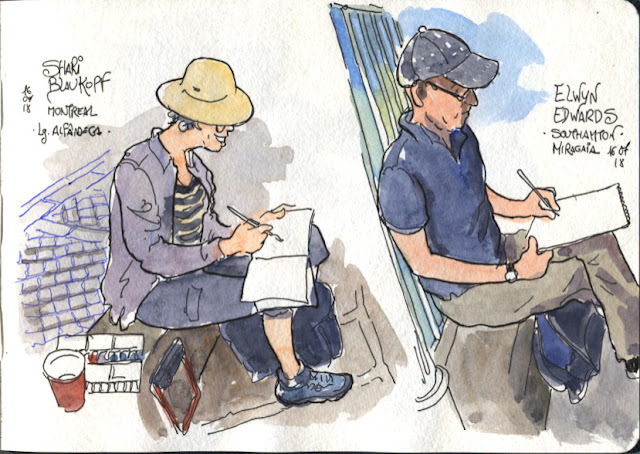 A few meters upstream, Viktoria Cvetkovic from Cologne, to whom Porto isn't new, as we met last year in a local meeting at the now closed Bolhão market. 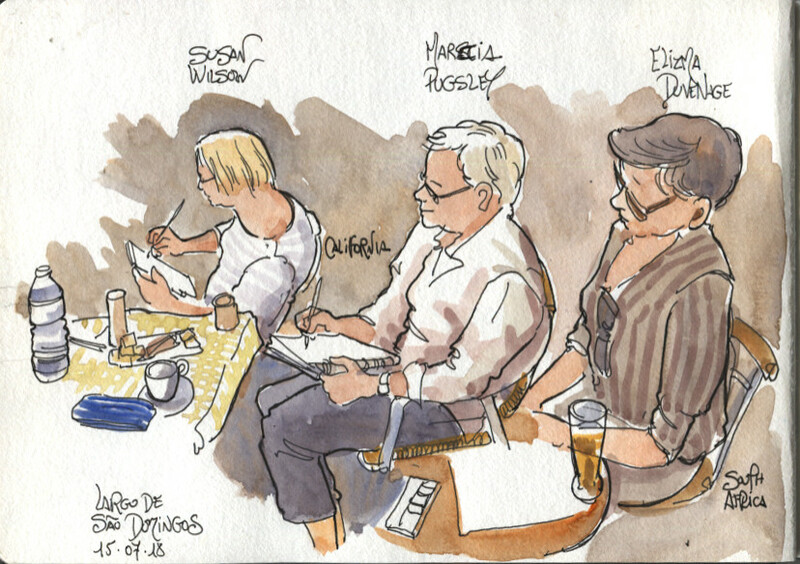 Closer to the bridge, Symposium instructor Róisín Curé from Galway, Ireland, was busy capturing a beautiful yellow Rabelo boat. 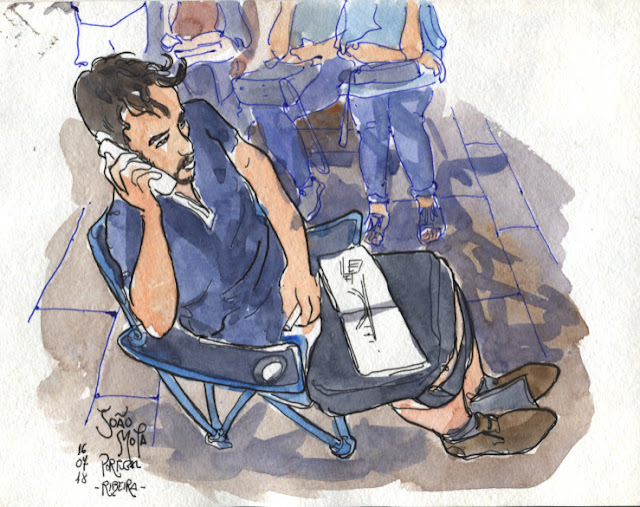 In early afternoon, my hyper-talented sketcher friend João Mota was making a pause in his sketch to buy and sell shares in the stock exchange... Or so it seemed. Coming back down to the riverside after some errands in the city centre, I found Instructor Shari Blaukopf from Montreal at Alfândega square, just in front of the Symposium hub, getting prepared for her workshops and demo. A few meters away, I had the chance to meet Elwyn Edwards from Southampton, UK, who was dealing with the complex building chaos of Miragaia. At this point in late afternoon, I had a few kilometres under my soles and my throat in serious need of a refreshment, but feeling extremely happy with the atmosphere and friendliness of the increasing sketcher population. This was my last of the day, in the company of Victoriano de Lerma from Madrid and Isabel Alegria, not pictured (yet). It was time to go back home, and save some energy for the next days.